Dance in the age of climate change: Diana Damian Martin discusses this year's Ravnedans festival in Norway. Lots of People, performed as part of Ravnedans. Photo: Arild Danielson. Kristiansand is a small town in the south of Norway, adorned by inlets of ocean and crossed by the river Otra, crowded by thick green forests and covered with wooden houses and low concrete blocks and open water at every corner. And in Kristiansand, there is dance. There is dance by the harbour. There is dance against the patchy noise of a riffing guitar. There is dance by crowds of strangers, bodies covered in kaftans and richly patterned headscarves. There is a dance of breath in the upstairs white box room of the art museum. There is dance late at night at Alladin, on the stage of a cinema, disco lights bouncing off an imposing and dormant white screen as bodies rock and jump and arms rise and fall. There is dance as the waves of the sea peak and drop. There is dance in the rhythms of people walking the streets. There is dance in the morning, when groups of us gather to form a line and run into the water, no matter the weather, like a ritual of beginning. At this time of the year, Kristiansand moves, in a choreography of the staged and the accidental. This is Ravnedans (Raven Dance), a contemporary dance festival run by an all female curatorial collective, the only of its kind in this part of Norway. Ravnedans started out as a brief series of walks and performances in the local park, dancers performing with and for friends ten years ago, and now takes over the entirety of the town for six days every July. This year, over eighty performers have come to Kristiansand, and the programme stretches from participatory and community-oriented work, to site-specific dance, live art and commissions. There are also works collated from an open-call, two criticism residencies and workshops (one of which is the reason I am here), plus daily talks and events. It’s a breathing, moving body that is actively thinking about how to stretch dance from within, whilst entering into a conversation with the local that also keeps an eye on the international. Ravne means raven, and of course, there’s something deeply poetic about the name of the festival itself, and its discrete, fleeting, but gradual occupation of the city. I am here for Writingshop, my long-term collaboration with three other European critics that examines the changing nature of criticism against the backdrop of political shifts, and we’ve been talking about the passing of time and about criticism in an age of ecological urgency. How do we move with dance, and how does dance move us? What does it mean, in the age of the Anthropocene, to compose collectively? We’ve been talking a lot about dance as an awareness of the passage of time, as a kind of embodied attention. There is nothing being conceived about the future here, only the thinking about and moving of the present. It is a prescient train of though, one that weaves its way into the works of the festival. The day I head back from Ravnedans to London, an iceberg double the size of a small country breaks off an ice shelf in Antarctica, going adrift into the Weddell Sea. It feels so poignant, that not far from here, a newly calved iceberg is being moved by sea currents, wayward but somehow also with intent. Kristiansand is a place nestled by water and forests, by cliffs that hang heavy, and water that is slowly rising, eating up the land. It is a place of wind and of the north, and dancing here is as much an ecological act as it is a human gesture. It is as much about the body as movement or stillness, as it is about the idea of place as moving and being moved. Here, the body is always of a place, and it is always against the backdrop of the environment. It is here that dance confronts a poetics of change, both within, and outside of the body. The day I arrive, I hop on a bike to the local park, Ravnedalen (the place that gave the festival its name). It is guarded by tall cliffs and has winding paths surrounding a small lake. I am here for a double bill of work, Lots of People by Ingvild Isaksen and Shadows of Tomorrow by Ingri Fiksdal. Both are performances that stand out for their ways in which they reflect on attention as an ecological concern, a kind of arrival at dance as an atmosphere, rather than simply as an event. In Lots of People, choreographer Isaksen explores prediction, drawing on participation, dramaturgy and movement. The performance concentrates on a deconstructed interview with Dr Leonard Mlodinow about the psychology of prediction in humans and animals. In doing so, it speaks to the inability of the human mind to cease the game of prediction, even when the game itself is flawed, or doomed to fail. Lots of People situates this notion of pattern in both and in place; and talks about the blurry lines between real and false, between cognition and embodiment, and between internal and external. 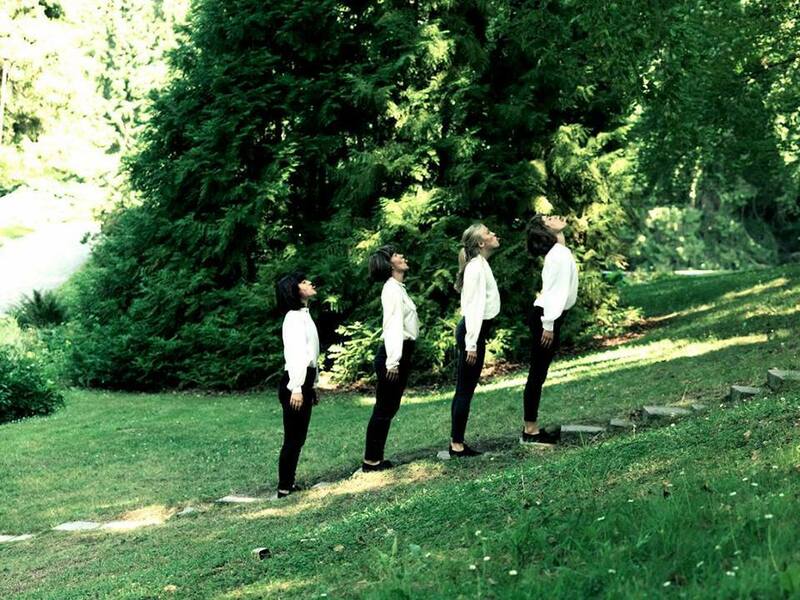 Early on in the performance, an all-female collective of dancers, all wearing white baroque shirts and black trousers, divide the audience through a seemingly random process, and each group is lead to a different area of the park. We’re invited to claim the validity or falseness of statements about climate change and desire, and have limited time to solve a brief task. Yet this apparent game turns into collective attention, when we come together in the park to guess karaoke songs and witness a collective choreography that deals with pattern, body and anticipation. Whilst the work occasionally feels disparate, there’s a bigger question at stake, involving our collective ability for agency, and distinction – a kind of critical interrogation of political structures based on psychology. This sense of collectivity also emanates strongly in Shadows of Tomorrow, which presents itself as an immersive experience of a psychedelic concert, in which bodies – wrapped in a plethora of clothing that doesn’t allow for any one identification – move and part, sync and drift. Inspired by a psychedelic hip hop album by Madvillian and MF Doom and the cosmic journeys of a Sun Ra piece, the performance toys with the notion of beat as an embodied energy, and teases at the abstraction of being together. We’re crossing into the territory of the musical commune, and of course, musical specificity, too, which the performance deals with through its engagement with choreography. At a time when gatherings have become inherently politicised, when public spaces are under threat and when difference is being erased, teetering on the edge between crowd and group, between commune and gathering, feels essential, especially through a poetics of the body. And in Shadows of Tomorrow, feet stamp on wet ground, shoulders pulse in strange synchronicity, hands clasp and release whilst birds dive in front of dramatic cliffs, and light rain touches the sweaty bodies, trying to listen together. In a similar way to Lots of People, there’s a political looseness to the work that both elevates and problematises it. The aesthetic choices behind the clothing – headscarves wrapped around obscuring faces, long trousers underneath kaftans – have a strange resonance in a place that’s not isolated from migration and whose assimilationism is a disputed political strategy for cultural integration. I couldn’t help but think of displaced bodies, of the violent acts of misrecognition and invisibility that are cast upon them, and what it means, now, to silently watch bodies move across a landscape, in an eerie, if unsettled representational game. If I experienced these pieces on and about togetherness through my own engagement with the political and natural ecologies of Norway, I was also thinking about recent discussions in dance about what constitutes movement and stillness, and how they echo into other spheres of life. In both Lots of People and Shadows of Tomorrow, choreography acts as a tool through which to see modes of organising as not distinctly form or content, but both. Within this, there’s a momentum to asking: who provides mobility, who is able to access it, what do we see as movement, and what keeps us moving together? Yet movement is not just an embodied concern, it is one that pertains to time, as well. In Tone Kittelsen and Maja Hannisdal’s beautiful dance film The Nordic Escape, dance becomes of the landscape. Kittelsen’s body, dressed in wool, a red dot against a wild landscape in constant change, becomes another mode of life and breath. The choreography revolves around the outside of a lone lighthouse, and is occasionally layered by a brief narrative score about personal confrontation, about the fear of isolation, and the poetics of the lone traveller. It’s a beautiful meditation on what compels our sense of isolation, and of the concerns that shape the direction of our movement, at a time when our distinct conflict with the natural world has entered a new phase of danger. Similarly, Siri Jontvedt and Ivar Grydeland’s piece Can’t You Hear What I’m Dancing is a duet between a dancer and noise musician that taps into ideas about listening, and internal and external landscapes. Whilst the piece explores the often disparate energies of sound and body, it also experiments with the very notion of material: what performs on stage, and how are we drawing such distinct boundaries between human and constructed, natural and artificial? The drone-like reverberation, minimalist, rising soundscape and a seemingly repetitious movement structure invites us to feel and see, again, differently. And whilst similar experiments tend to foreground language as a means of fragmentation, or of accessing something beyond the body, Can’t You Hear… toys with the idea of instrument – the distorted riff of a guitar, the abstracted movements of a body in response. It is danger zones that emerge as the thinking space for dance in an era of climate change. And in the midst of a landscape whose loud, imposing features remain the backdrop of collective movement, it’s hard not to imagine that the bodies that pop out from behind trees, stamp on grass, run towards the mountain, and jump in the sea, are bodies of ecological care. Ravnedans took place in Kristiansand, Norway, between 8 and 13 July 2017. Writingshop undertook a residency hosted by Ravnedans and Critics in Conversation, supported by Norsk kulturraad and Fritt Ord, led by Anette Therese Pettersen and Diana Damian Martin.